Sometimes you need a break from the action of the parks and just want to have some fun in the sun. There are so many options to help your family cool off and catch a break while on vacation in Disney World. Disney has two water parks on property; Typhoon Lagoon and Blizzard Beach. They are both packed with fun for children of all ages. And you can add the water park and more option to any Magic Your Way Package, just ask your travel consultant. 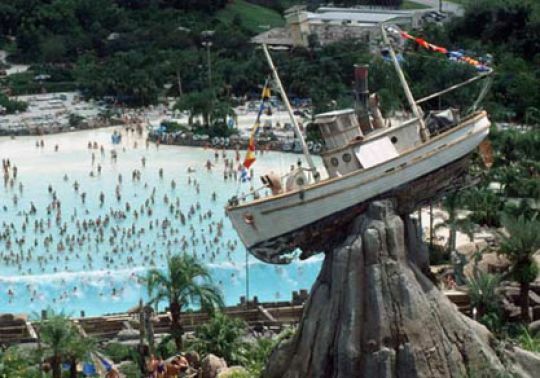 Typhoon Lagoon is an escape to paradise with attractions for the whole family. Here are a few of the popular attractions to look for....Crush "n" Gusher is a roller coaster like water-slide. Keelhaul Falls sends you rushing down the mountain on an inner-tube through a waterfall and cave tunnel. There is fun for the little kids at Ketchakiddee Creek with 10 different activity areas or have some family fun on Gang Plank Falls, it's a 300 ft long water-slide. There is a sandy white beach to relax on along with a surf pool that cycles 6 ft waves and smaller waves to give everyone a chance to enjoy the water. You can learn how to surf, snorkel with the sharks and stingrays at Shark Reef or just enjoy a relaxing raft ride around Castaway Creek. Blizzard Beach looks like a frosty ski resort complete with a chairlift to take you to the action packed water-slides. It features one of the worlds tallest and fastest free falling water-slides, Summit Plummet! There is fun for all ages including thrill rides like Run off Rapids, which sends you twisting down Mount Gushmore. Slush Gusher that is a 90 ft tall water-slide and Snow Stormers, a water-slide that takes you on a slalom style racing course. A special area for the little ones to play is called Tike's Peak and for the bigger kids, there is Ski Patrol Training Camp. Then my family's favorite, Team-boat Springs, a raft ride that fits the whole family. For those who want to take it easy, they can take a leisure raft ride around Cross Country Creek. If water parks don't "float your boat" so to speak, then another option is to check out some of the large whimsical pools at Disney Resorts. There are so many to choose from, but I am only going to touch on a few. Disney pools are reserved for the guests staying at each specific resort, so it's best to decide which one is your favorite before booking your vacation. At the Value Resorts, the Fantasia Pool at Disney's All-Star Movie Resort is a great pool with Sorcerer Mickey Motif. It also has a duck pond pool and kiddie pool. It takes you back to the classic movie. At the Moderate Resorts, the pool at the Carribean Beach Resort is one of my kids all time favorites. It is a large Spanish Fort-Themed Pool with a water-slide and a great area for kids, complete with a ship that has waterfalls, water-slides and water cannons. It also has a wading pool and a whirlpool. It's lots of fun!! At the Deluxe Resorts, there are so many great pools, it's hard to choose just one. The Beach and Yacht Club Resort has a 3 acre Storm-along Bay pool, it features a 230 ft water-slide, floating lagoon and a sand bottom kiddie pool. 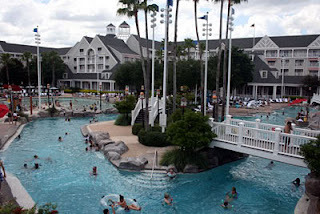 This is by far the most popular pool at Disney Resorts! Another pool in this category is at the Polynesian Resort. It is a zero-depth entry Nanea Volcano Pool with a waterfall and water-slide. If you want to feel like you are in Hawaii, then this is the pool for you. It's a place to relax and take in the beautiful scenery! So, if you want to take some time to cool off or soak up the sun....think about the water parks and pools Disney has to offer and make a Splash on your next Disney World Vacation! !